WORK WITH YOUR FITNESS TRAINER. They can aid you in a safe and easygoing workout. Keep a written track record of your progress. This helps you build a routine and have confidence in an injury free program. 1) BENCH PRESS. I use the 50% 75% 100% weight capacity. This means you do 50% of your days max weight to start Then move up to 75% of max and finally to 100%, your max days weight. 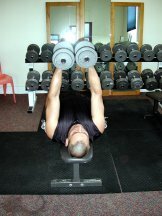 I do 15 reps. in each percent of weight which works out to three sets. 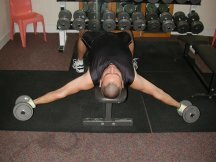 Start with upper arms horizontal to the floor to end up in the position shown. It must be noted that all these weight exercises can be done in a variety of ways. 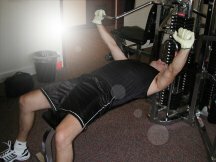 Free weights, machine weights and resistance with no weights. Denise likes to use the exercise balls to help keep perfect form. 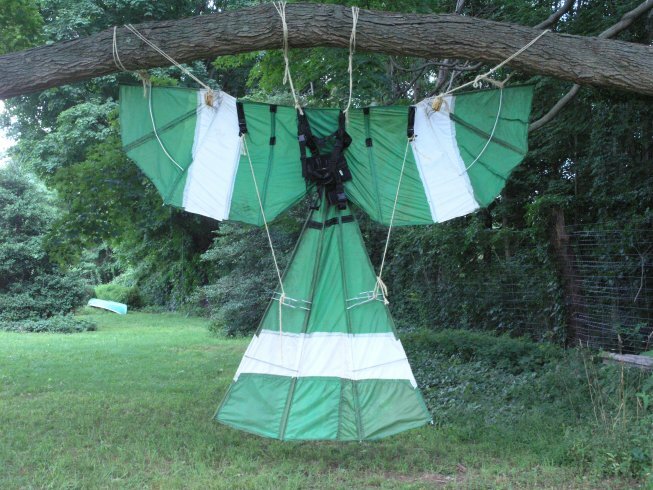 2) FLIES. 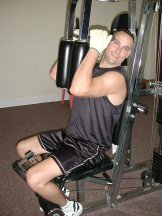 Start with arms outward and end up in position shown. ALERT: Don't be like me. Never turn your head in the middle of an exercise. 7) TRICEPS. (Dips) Not shown. Fletcher I. My first design from 1997 that did not do well, but I learned a lot to come up with the red bat design.